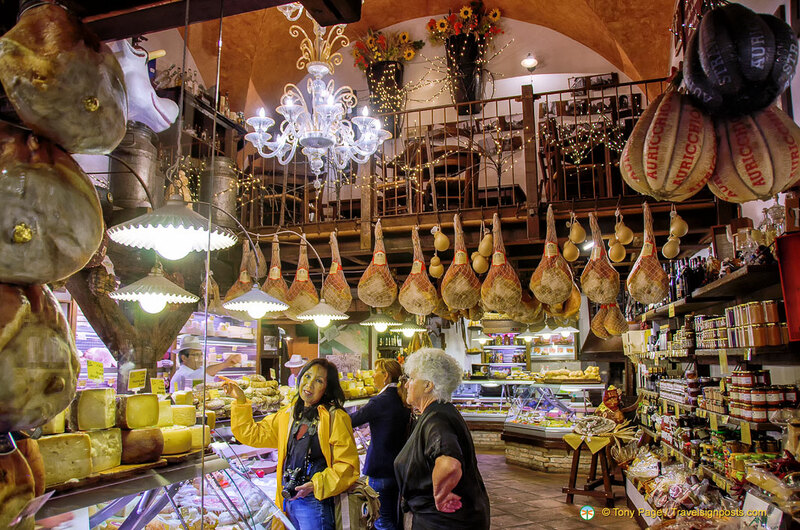 The Emilia-Romagna region is famous as a food centre and when we visited Bologna we were very much looking forward to sampling some of its gastronomic delights. During our whistle-stop visit to Bologna we took a stroll down Via Pescherie Vecchie which is the food market area just off Piazza Maggiore. Along this market street are many food shops that will make any food lovers salivate. Beautiful fresh fruit and vegetable stalls line Via Pescherie Vecchie and it was a delight to see fresh mixed salad being sold in market stalls rather than in sealed packets out of a supermarket. Also to be found along this fabulous street are cheese shops, butcher shops, and many other delicatessens. At La Baita we were attracted by the marvellous food on display in the shop window. Through the doorway, we saw various types of legs of Parma ham and sausages. Although we do not eat meat, it was nevertheless a delight to see quality produce adorning the shelves and ceiling of the shop. At the entrance of the shop a young lass sat at the till and there was also a red ticket machine which the locals knew to take a ticket before entering the shop to buy their goods. Initially I wondered if inquisitive tourists like me would be allowed in and when I finally eased myself into the shop, I was pleased that no one objected to my presence or taking snaps of the food. Parmigiano-Reggiano or Parmesan cheese originates from the Emilia-Romagna region and the Parmigiano on display in La Baita looked good and cheap at Euro 19.50 per kilo. Tony suggested that we buy some good quality parmigiano, so that we could sample some of Bologna’s best products. Our lack of Italian language skill didn’t allow us to get into a discussion with the shopkeeper on the best parmigiano and luckily one of the local shoppers came to our aid and advised us that the cheese that we were looking at isn’t the best parmigiano. She told the shop owner that we were looking for good parmesan cheese and he pointed us to his best Parmigiano-Reggiano which has been aged for 36 months. We bought a wedge of this and the 400 gms wedge cost us Euro 9.00, which is so much cheaper than what we have to pay for back home. We had some of this for lunch and it was absolutely delicious and on par with the best parmesan that we could get back home. La Baita quickly became one of our favourite shops in Bologna and if you have time to stop for lunch, you could also have a meal in the upstairs of the shop. If you love food and want to find out more about Bologna and its famous food tradition, you can join a Gourmet Walking Tour of Bologna and learn about pasta, mortadella and chocolate-making in this city. See more Bologna food photos at Travelsignposts Bologna Food album. Just had a look at your blog, really good, I am going to Bologna in May 2018, never been before and really looking forward to it. I have been to a lot of places in Italy and found the big Market place in Florence really good. I have also been told that Bologna is the food capital of Italy, Looking for reallt nice eating places.